Allow me to save some of you the trouble of reading this review in its entirety. 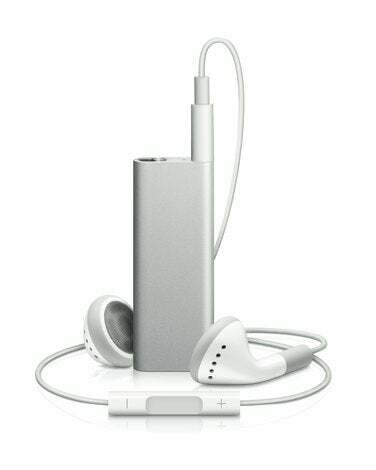 If you want an inexpensive iPod that holds 1,000 songs, know how to pack that iPod with exactly the tracks you like to listen to, are perfectly happy with Apple’s earbuds, and rarely hunt for specific tracks on your iPod, the third-generation (3G) iPod shuffle is a reasonable choice. If, on the other hand, you want a more flexible iPod that lets you use any headphones you like, suspect that you’ll grow frustrated by controls that make it a small chore to navigate the iPod’s music collection, and wish to avoid jumping through hoops to use your iPod with an audio device other than Apple’s headphones, this is not an ideal iPod for you. Continue to use the iPod you own, save your money for the far more flexible $149 4G iPod nano, or drop $49 on the still-available 1GB second-generation (2G) iPod shuffle ( ). Before we turn to the intriguing question of whether an iPod without physical controls makes sense, let’s dispense with the technical details and the iPod’s performance. The $79 3G iPod shuffle comes in a single 4GB capacity in either a silver or black anodized aluminum case that’s approximately the size of a AA battery. Like the previous 2G iPod shuffle, this iPod bears a clip for attaching the iPod to your clothing. At the top of the shuffle is a small three-position switch—Off, Play-in-Order, and Shuffle—a small status light that glows different colors depending on the state of the iPod’s charge (as well as blinks in response to presses of the headphone controller), and an Earphone port. Apple suggests that the 3G iPod shuffle can continuously play for up to 10 hours on a single charge. In my tests this shuffle exceeded that estimate by just over 20 percent. Packed with 128kbps AAC files between three and five minutes long and set to medium volume, the shuffle played for 12 hours and 12 minutes before the battery drained fully. While it’s nice that this shuffle bested Apple’s estimates, it offers less play time than the previous shuffle, which, rated at 12 hours of continuous play, managed to play non-stop in our tests for 16 hours and 31 minutes. This iPod shuffle sounds as good to my ears as the last. And it provides plenty of volume. Also, this is the first iPod shuffle that plays all the audio formats supported by the larger iPods—AAC, MP3, AIFF, .wav, Audible, and Apple Lossless. Previous iPod shuffles don’t play Apple Lossless files. This is also the first iPod shuffle that lets you place more than one playlist on the device. Additionally, when you sync it in iTunes, audiobooks and podcasts are automatically placed in their own playlists. This is welcome, as playing audiobooks and podcast episodes in order with previous iPod shuffles took a fair bit of playlist fiddling within iTunes. And, as with the previous iPod shuffles, you can autofill the 3G shuffle from your entire music collection or specific playlists. The included headset is similar to previous iPod headsets except that it bears a controller incorporated into the right earbud cord. For better or worse, these earbuds fit as well (or poorly, depending on the shape of your ears) as the earbuds included with other iPods and the iPhone. The controller has three buttons—Volume Up on the top, Volume Down on the bottom, and a multi-function Play/Pause button in the middle of the controller. In addition to playing and pausing tracks, you use this button to move between tracks and engage the optional VoiceOver feature—a feature that causes a computer-generated voice to speak the names of tracks, artists, playlists, audiobooks, and podcasts. You aren’t completely barred from using third-party headphones or other external audio devices, but you lose the ability to navigate the iPod when you do. You can plug headphones or a mini-plug audio cable into the iPod and switch it on. Do this and it will play from where it stopped when it was last paused or shut off. It will also play at the same volume as was last set. To change the iPod’s output volume you must plug in some headphones that have a compatible controller and make the volume adjustment with those headphones. Inconvenient? Oh yes. To navigate the iPod with this controller you must memorize a number of pushed-button sequences. For example, to move to the next track in a playlist using the controller, you press the Play/Pause button twice in rapid succession. To back up a track, press the button three times quickly. To fast-forward through the currently playing track, double-press and hold the button. To rewind, triple-press and hold. The included Start Here guide fails to mention these last two sequences. This Play/Pause button is also the key to engaging VoiceOver—a spoken interface to the faceless music player. To have the iPod speak the names of the song and its artist, press and hold the Play/Pause button. To navigate to another playlist, continue holding the button until you hear a tone. Let go of the button and the iPod speaks the name of the currently playing playlist followed by the names of other playlists in alphabetical order, followed by podcasts and audiobooks. You can move more quickly through this list by pressing the Volume Up or Volume Down buttons to move forward or back respectively. To choose one of these items, press the button again when you hear its name. It’s easy enough to move among playlists, but all this pressing to traipse through multiple items in a playlist is clumsy. Not only is it likely some users will forget which combination of presses transports them from place to place, imagine trying to shift from an album’s seventh track to its first. 18 presses? No thanks. At the risk of complicating the remote even more, it would be nice if there was a “Go to beginning” sequence. Given the number of controller sequences and the potential to get them wrong, I suspect a lot of 3G iPod shuffle owners will forgo all this button pushing and use this shuffle exactly as they would a previous model shuffle—turn on the iPod and let it play. Interesting though VoiceOver may be, its implementation is a little uneven. You can choose from among 14 languages as the default. If your Mac’s running Leopard and you’ve chosen to enable VoiceOver, an Alex voice will be installed on the iPod shuffle. (Yes, VoiceOver is optional. Disable it in iTunes and it won’t be installed on the shuffle. You might want to disable it in order to save the maximum amount of space—a full iPod can generate nearly 50MB of VoiceOver data—but you can't navigate without it.) This voice will speak the names of playlists, tracks, artists, podcasts, and audiobooks in English. If you choose a language other than English, Alex will continue to speak English titles, but the shuffle’s status messages—the battery status you hear when you rapidly turn the iPod off and then on, for example—will be spoken in the default language, using a lower-quality, mechanical-sounding voice. This same mechanical voice speaks much of the time when you come upon a track with a non-English title—Selig sind, die da Leid tragen from Brahms' Ein Deutsches Requiem, for example. (I say “much of the time” because Alex tries to speak the Spanish titles. His pronunciation isn’t very good, however.) If you sync your shuffle with a Mac running OS X 10.4 (Tiger) or Windows XP or Vista, the computer will download and install a VoiceOver package that features a lower-quality female voice. When comparing this new iPod shuffle to previous shuffles, it’s tempting to ask, “What shortcoming of the previous iPod shuffle was Apple trying to address with this one?” Let’s ask and answer some of those questions now. Was the 2G shuffle too large? Hardly. In fact, the 3G shuffle is now so small that those with adult-sized fingers may find it difficult to use the switch on the top of the iPod. This is more important than it appears because, with VoiceOver engaged, the iPod will tell you the state of its battery charge when you flick this switch rapidly off and then to one of the play positions. I found that difficult to do because not only is the switch very small, but it’s nearly flush with the top of the iPod. Even flicking the switch to the right position can be difficult with large fingers. Children and those with well-honed fingernails will have an advantage in this regard. Did the 2G shuffle offer too little storage? The iPod shuffle is the ideal workout companion because it’s lightweight and can be clipped to your clothing. The previous $69 2GB 2G iPod shuffle held 500 songs; which ought to get even professional athletes through their daily workout. However, this shuffle supports Apple Lossless files, whereas the previous shuffles didn’t, so those who prefer these larger files could justify the need for greater capacity. And, because the shuffle is priced at under $100, it’s an iPod that parents will give to kids, whose music collections could exceed the capacity of a 2G shuffle. Were the 2G shuffle’s controls awkwardly placed? For a few users, yes. If the shuffle really is most at home with sporting activities, getting to its controls can be a problem if, for example, you use it while snowboarding or skiing (when it’s tucked away). Having the controls on the headset is more convenient in some situations. Were the 2G shuffle’s controls too hard to use? What could be more intuitive than a large (given the size of the iPod) Play/Pause button, Previous and Next buttons, and Volume Up and Volume Down buttons? Convenient though the location of the headset controls may be, it’s hard to make the case that double- and triple-clicking a button dangling from an earbud is easier. Was it too difficult to navigate the 2G shuffle? Unless you needed to skip forward or back a few tracks, yes. With previous shuffles it was nearly impossible to find exactly the song you wanted to hear without a lot of button pushing. The 3G iPod shuffle gives you some control over finding your music thanks to VoiceOver and the ability to now place multiple playlists on the shuffle, but a display-bearing iPod is far more navigable. Did the 2G shuffle’s ability to use third-party headphones send its users into a panic over which headphones to buy? I joke. Of course not. If, like many iPod owners, you use the shuffle as a second iPod it’s possible you already own third-party headphones that you like. This controller-on-cord setup requires those users to put up with Apple’s earbuds (which they presumably don’t like given that they’ve already abandoned them once), purchase another set of headphones that have a compatible controller, or buy an adapter that carries a controller. How Apple and other companies design such an adapter will be interesting to see. Third-party headphones already bear a cable of suitable length. If the point of the built-in controller is to get the shuffle’s controls near your head, do you then create an adapter with a long cable? And, if so, what do you do with all of the now-unnecessary cable dangling from your third-party headphones? And if the adapter is short, haven’t you defeated the purpose of having accessible controls because the adapter is now in your pocket along with the iPod? Neither solution is ideal, which makes you wonder how much thought Apple devoted to those who don’t wish to use the earbuds packaged with the iPod. Was the 2G shuffle’s design getting long-in-the-tooth? Absolutely. Apple unveiled the original 1GB 2G iPod shuffle in September 2006. Two-and-a-half years is two-and-a-half lifetimes in the gadget world. Unless you’re among those who believe that Apple’s sole motivation is to astound the world with innovative products, you understand that its primary goal is to sell its wares. Releasing new versions of old concepts is part of the process. Apple had taken the nearly predicable path of expanding the 2G shuffle’s capacity and then offering it in a variety of colors. It was time to do something different and that something is the 3G iPod shuffle. And what do these questions and answers tell us? Apple needed to release something it could call an iPod shuffle and that iPod shuffle has its strengths and weaknesses. Its strengths are greater capacity and a means for navigating the device. Weaknesses include a navigation system that—thanks to the lack of controls on the iPod—is more difficult to use than it needs to be and a requirement that those who want to take advantage of this shuffle’s controls must accept the included headphones, spend extra money for compatible headphones, or hope that compatible adapters appear soon. As I said at the beginning, if you’re happy with Apple’s headphones and don’t care a lot about navigating your iPod, this could be the iPod for you. I, however, cherish my third-party headphones, find a controller that requires memorizing a series of button sequences an unwelcome burden, and don’t need an even smaller iPod shuffle. Like the MacBook Air and Mac mini, the 3G iPod shuffle is a product designed for a particular kind of user. You may be that user. Regrettably, I'm not.